Les Payne is a pioneering journalist, author and art collector. Born in Tuscaloosa, Ala., Payne graduated from the University of Connecticut, then, during a tour in Vietnam as an army captain, ran the Army's newspaper and wrote speeches for the commanding General William C. Westmoreland. Payne joined Newsday as a reporter in 1969, and later ran the newspaper's national, science, and international desks, and served as editor of NY Newsday. As an investigative reporter, he won a Pulitzer Prize in 1974for The Heroin Trail, a 33-part Newsday series tracing the international flow of heroin to New York City. Payne covered the assassination of Martin Luther King, the Black Panther Party, the Symbionese Liberation Army, and wrote a weekly syndicated column for 28 years. He reported extensively from Africa, Europe, the Caribbean and the U.N. A co-founder and former president of the National Association of Black Journalists, he has taught at Columbia Journalism School and received honorary doctorates from UCONN, Medgar Evers College, Long Island University and Old Dominion University. Payne has won the United Nations’ World Hunger Media Award, three Unity Awards for investigative reporting, and cable television’s Ace Award. Leslie Bowen, a painter and educator, holds a BA from Moore College of Art and received her MFA from the Pennsylvania Academy of the Fine Arts. She taught at Lebanon Valley College for ten years, where she received the Nevelyn J. Knisley Award for Inspirational Teaching. Bowen has participated in summer programs at the Paris American Academy, the Salzburg International Summer Academy of Fine Arts, and Southampton College, Long Island University, New York. Her works are in private collections and in the permanent collections of the Lancaster Women and Babies Hospital and the University of Pennsylvania. She teaches at Millersville University and at the Barnes Foundation. Dr. Michael L. Penn is a Professor of Psychology and a licensed Clinical Psychologist at Franklin & Marshall College. His research interests and publications include works in the pathogenesis of hope and hopelessness, adolescent psychopathology, the relationship between culture and psychopathology, and the epidemiology of gender-based violence. Penn has lived, traveled and lectured in more than thirty countries, and has been invited to serve as a consultant and speaker at United Nations-related conferences in Europe, North America and the Caribbean. He is the author of “Overcoming Violence against Women and Girls: The International Campaign to Eradicate a Worldwide Problem” (Rowman & Littlefield, 2003). Professor Penn was inducted into Phi Beta Kappa in 1986, is a former Ford Foundation Fellow, a former Aspin Institute Fellow, and is the recipient of several academic awards, including the John Russwarm Award for Scholarship from the University of Pennsylvania. Jesse Washington (son of the artist, brother of exhibition curator Elizabeth de Souza) is a senior writer for ESPN's forthcoming website, The Undefeated. Jesse's journalism career began at the Associated Press, where he served for 15 years, seven of them as AP's race and ethnicity writer. Jesse has also been AP's entertainment editor, national desk editor, and New York City assistant bureau chief. He's also worked as managing editor of Vibe magazine, founding editor in chief of Blaze magazine, and co-founder of the street basketball magazine Bounce. In 1999, he republished his father's book, The Art of Romare Bearden: The Prevalence of Ritual, followed by a second edition of The Art of Elizabeth Catlett. His novel Black Will Shoot was published in 2008. A Yale University graduate, Jesse is married with four children and a member of the Baha'i Faith. 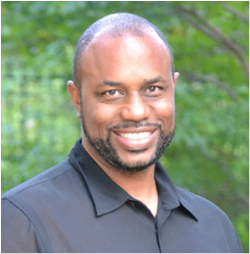 Eric Dozier is a musician, composer and theologian whose work explores the confluence of music, community, education and activism. He holds a BA from Duke University and a Masters from Duke Divinity School. Eric is the Co-Founder and Creative Director of One Human Family Workshops, Inc, a nonprofit organization dedicated to the eradication of prejudice through the arts. He also is the Musical Director and Curriculum Consultant for the Children’s Theatre Company of New York City. Eric’s past positions include the Directorship of the Harlem Gospel Choir, as well as extensive work touring internationally as an arranger, composer, and performer of various genres of music. Eric lives in Nashville, Tennessee with his wife and two children. Amy Loder has worked in fashion and business development for more than ten years, and has a master's degree from Transformative Leadership Studies and Social Change. Her family also has a history of working in sewing, tailoring and fashion. Her earliest examples of fashion and personal style were her grandmother and aunt. Amy is passionate about authenticity in personal style--witnessing people living their inner truths brings her great joy. Amy lives in Washington, DC. Nick Chiles is one of the nation’s foremost chroniclers of African-American life, culture and celebrity. He has won more than a dozen major journalism awards, including a 1992 Pulitzer Prize as part of a New York Newsday team. He is the author or co-author of 13 books, including two New York Times bestsellers. Nick is a graduate of Yale University, and lives in Atlanta with his wife, Denene Millner, and their two children. Kyoko Mori is the author of three novels (Shizuko's Daughter;One Bird; Stone Field, True Arrow) and three nonfiction books (The Dream of Water; Polite Lies; Yarn). Her stories and essays have appeared in Ploughshares, The American Scholar, The Kenyon Review, The Prarie Schooner, Harvard Review, The Best American Essays, and other journals and anthologies. 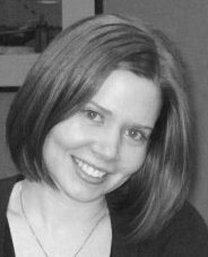 She lives in Washington, DC and teaches at George Mason University’s MFA Program in Creative Writing and at Lesley University’s Low-Residency MFA program. Denene Millner is an award-winning journalist whose insightful and captivating pieces have secured her foothold in the entertainment, parenting, social media and book publishing industries. The three-time New York Times best-selling writer has authored or co-authored 23 books, and has been a contributing writer for EBONY, Essence, Parenting, Money, Health, Honey and a host of other publications. She is also the founder of the award-winning parenting website, MyBrownBaby. 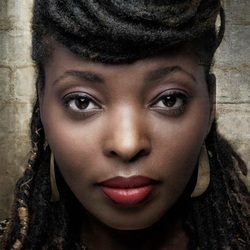 Most recently, a novel she co-wrote, "The Vow," aired as a Lifetime movie in 2014, and the 2015 memoir that she co-wrote, "I Am Charlie Wilson," peaked at No. 3 on the New York Times bestseller list. TAFA is an award-winning artist whose paintings have been exhibited and collected in Europe, Japan, Canada, South America, Africa and the United States. His abstract oil paintings depict strong social, political, religious statements in audacious, brilliant colors. His abstract sports and music paintings portray these activities with the energy one would usually expect from an actual performance. Michael Valentine is the founder and owner of Valentine New York, a firm that specializes in publishing fine art books and magazines as well as organizing, planning, and curating art exhibitions. He is also the creator of the newly-launched Breuckelen Magazine, a quarterly publication celebrating art and culture in Brooklyn. The firm first established itself in 2003 by mounting “The Amistad Collection,” an exhibition that explored key aspects of the rebellion at sea of the African slave ship "La Amistad". In 2005, the firm released "Between the Raindrops," a limited edition fine art book celebrating photographer Hugh Bell. Valentine New York currently has sixteen fine art books in various stages of development, and is also the custodian of a collection of approximately 1,000 works of art. 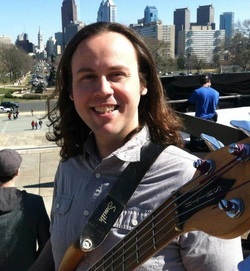 Ian Rafalak is a bassist, producer and educator from Phila, PA. He holds an M.M. in jazz studies from the University of the Arts and a B.M. in music performance and education from Ithaca College. Ian’s unique sound stems from his studies with Gerald Veasley, a world renowned bassist, and Pablo Cohen, an award-winning classical guitarist, as well as his time in Ghana studying traditional West African rhythms. Ian’s work as a producer and orchestrator has included music for VH1 and the BBC. He is currently an adjunct professor at Camden County College as well as an in-demand musician in the Philly scene, playing with groups such as Jeanette Berry and the Soul Nerds and Trinidelphia. Ian lives in Philadelphia with his wife, Brittany. Lloyd Lawrence is an interdisciplinary artist, poet, and a graduate of the Tyler School of Art. 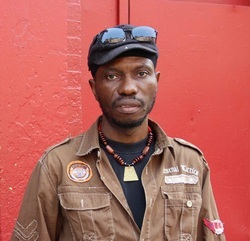 He is a protege of Sonia Sanchez, and has studied painting at the University of Washington under Jacob Lawrence. After living and working in Italy and Japan, he settled in New York City in 1999. In 2000 he was the creator of “Hush Harbor,” an NYC-based monthly gathering that joined artists, musicians, and regular folk in a shared act of prayer and reflection. Lloyd is also co-creator and curator of “Urban Juke Joint: A Nobler Expression,” a monthly open-mic in NYC that fosters community through poetry, spoken word, and the visual arts. He and his wife live in New York City.